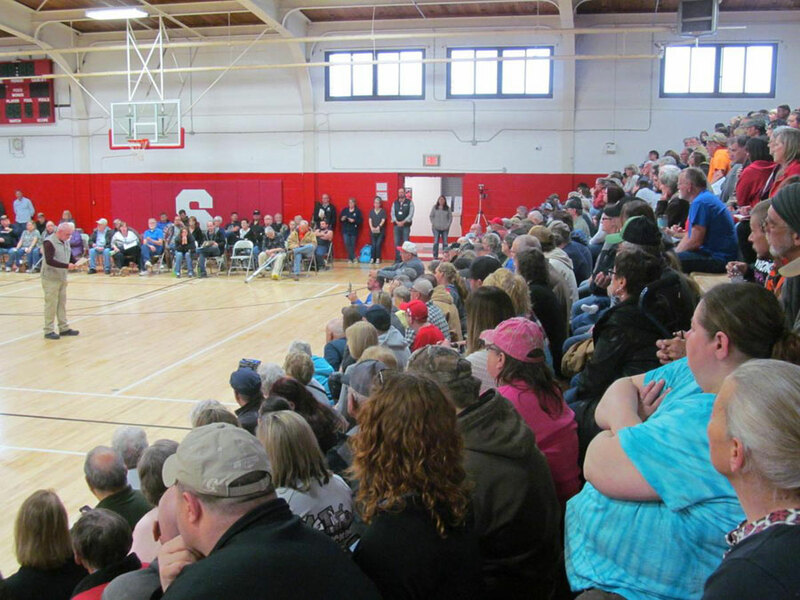 Fremont County residents listen to Emergency Management Coordinator Mike Crecelius at a flood meeting. One of the governor’s top aides is in southwest Iowa today meeting with local officials to discuss how to repair the levees that have been breached by Missouri River flooding. Governor Kim Reynolds said she’s aiming for a regional approach to the flood disaster. According to the National Weather Service, high flood waters have returned in Montana, the Dakotas and northwest Nebraska along smaller rivers that feed into the Missouri. Reynolds announced last week that every Missouri River levee from Council Bluffs to the Missouri border had been compromised. 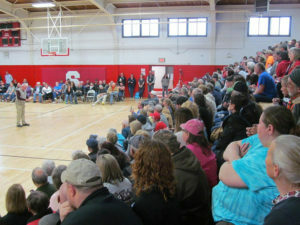 An overflow crowd gathered in Sidney Sunday to hear directly from local officials who’ve been evaluating flood damage. Fremont County Emergency Management Coordinator Mike Crecelius said he didn’t want to sugarcoat the situation. Crecelius asked motorists and pedestrians to stay off the levees. With previously-evacuated areas of the county still off limits and some county roads underwater, Crecelius als0 urged residents not to drive around or remove barricades, or venture into flooded territory. Shelters for flood victims in Fremont County remain open at the United Faith Church in Sidney and Shenandoah’s Old Armory. The governor submitted paperwork to the Federal Emergency Management Agency indicating it would cost $525 million to fix the river levees in southwest Iowa.